FROM THE RECTOR Our Ecumenical Alpha course in An Solas Methodist Church in Jobstown on Thursday evenings has now finished. On Saturday 5th November we had the ‘Holy Spirit Day’ which is part of the Alpha course in St. Tomas’ Pastoral Centre where there was greater integration with the Alpha Group through a round of pre-organized activities. The day was a success and I feel the mostly male participants enjoyed getting to know the Holy Spirit and each other on a deeper level. As I mentioned in the previous Newsletter the Carmelite Convent in Firhouse had their final mass on Sunday 6th November. Hopefully a Christian organisation will take over the premises so the beautifully chapel, which was only built in the past ten years will be remain open to the public. On 11th November we welcomed the ITT for their remembrance service in the Church. The College has now reached over a quarter of a century and the list to remember is ever increasing. Following the service we went over to the Peace Garden (remembrance garden) in the College grounds followed by lunch. Thanks you to Sr Bernadette for organising the service. On Saturday 12th November I attended the Tallaght Person of the Years awards in the main ballroom of the Red Cow Inn. It was a delightful evening and it is heartening to see the community of Tallaght come together in such a positive way. When ‘new’ Tallaght was developed in the 1960’s there were no facilities and it was up to the community to provide them. The vibrancy of the community continues with the ‘second generation’ committee running the awards. It was lovely to see the daughter of Phillip Preston, last’s years recipient (for his work as youth development officer with Tallaght Rugby Club), who very sadly died during the year, present this year’s award to Simon Sweeney of Kiltipper Ramblers. Well done to all the recipients and to the organising committee. We continue to have tours of the Church and grounds for school children led by local historian Tomas Maher. I enjoy their enthusiasm and curiosity about not just about the structures of the parish but for also for the beliefs of the Church of Ireland in general. Some of the question I am asked would challenge the best of theologians! May I take this opportunity to wish all the readers of the Newsletter a very joyful Christmas and a happy New Year, and repeating, the verse in this year’s Mothers’ Union Christmas cards, ‘please remember the magic of Christmas is not in presents but in His presence’. Sat 31st December New Year’s Eve Multi Cultural Service at 11.15pm. CHURCH REVIEW Subscription of €40 is now due on orders of the Diocesan Church Review Magazine, please send payment to Parish Office as soon as possible. If you do not wish to continue with you subscription or if you would like start receiving the magazine, can you please let the Parish Office (462 6006) know before the end of December. HONORARY TREASURER Our Honorary Treasurer Jim Bird, after many years of service, has decided to stand down as of the Easter Vestry 2017. We are very grateful to Jim for all the work he has put into this position over the years, through good times and bad. As we come to the end of 2016 we are making parishioners aware of Jim’s retirement in the hope that someone in the parish will take on the job, keeping in mind that there will be assistance from the parish office. If interested please contact the Rector at 086 803 0239. MOTHER’S UNION / FAMILIES FIRST On November 14 Amy gave us a very interesting talk on her experience of walking the Camino in the summer. She brought along her rucksack packed for her walk and had carried it each day rather than have it delivered to the next destination. Contrary to what you might think Amy said she had found it liberating to carry her rucksack from place to place and not be reliant on anybody else. They reached their destination by early afternoon each day as they started early in the morning to avoid the intense heat of the mid day sun, having started later in the morning the first day and found the heat too much by early afternoon. When they finally reached Santiago de Compostela on the final day they were all delighted but still had about hour to go to reach the cathedral which is the final destination of all the pilgrims on the Camino. we would like to thank Amy for taking the time and trouble to give us a most interesting talk and maybe encourage some of us to take to the high road of the Camino. Our December meeting on Monday 12th will be ten pin bowling in Tallaght Leisureplex at 8pm followed by refreshments. 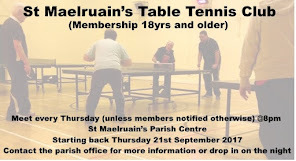 All are welcome so please give Valerie a ring if you would like to go as we need numbers for the Leisureplex. Cost will be 10e approx. Saoirse contribution for December is sweets and biscuits. Thanks a mil. TABLE TENNIS We would like to wish all our members a “Happy Christmas” and look forward to seeing you all back mid January. We would like to wish Bobby Wilson well following his recent brief spell in hospital. Looking forward to seeing you back in January, Bobby! Best wishes also to Brian, who hasn’t been well recently. We hope you’ll be back with us soon. FLOWERS FOR CHRISTMAS The Church will be decorated for Christmas on December 17th from 9 am to 1pm. All donations of flowers, greenery and help will be appreciated. All are welcome to join us , no experience necessary! Please come along, share the atmosphere and have a cup of tea or coffee with us. I would like to thank everybody who has helped with the flowers during the year, in particular to the ladies on the flower rota who ensure that there are fresh flowers in the Church each month, as well as for the festivities. Your help is very much appreciated. Thanks also to the people who donate beautiful flowers at Christmas, Easter and Harvest. We are always looking for new people to join the flower rota. It involves putting flowers in the Church for one month of the year. The month is always shared with another person. Perhaps you would like to do the flowers in a particular month in memory of a loved one. Again, no experience needed as there is always plenty of help available. 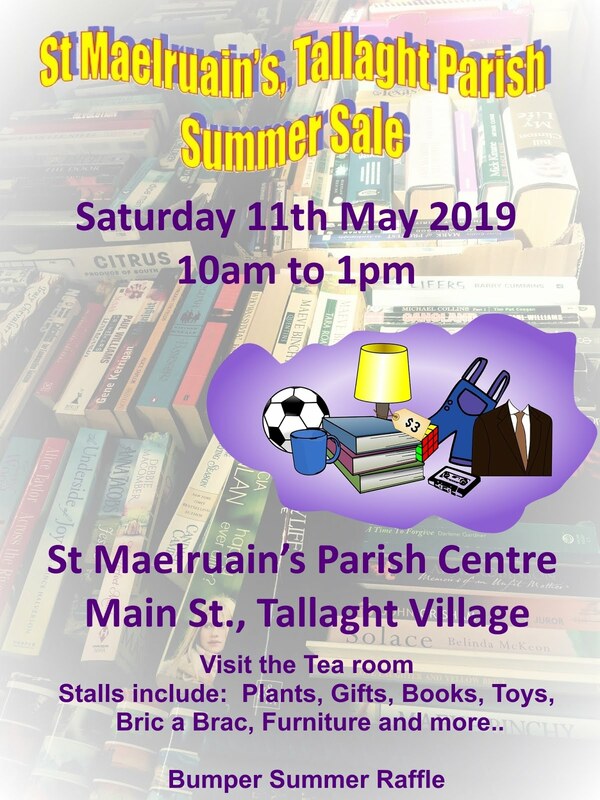 Please contact Regina at 4522930 or 0861255161, if you would like to help. Happy Christmas everybody and a happy and healthy new year. BOYS BRIGADE We had our Enrolment Service on Sunday 13th November followed by some tea and coffee which went very well. As these notes go to print we will be running the night of the Christmas Sing-a-long as usual. The night will involve a movie night for Company section and some festive arts and crafts for Juniors and Anchors. We will be finishing up on Friday 16th December for the Christmas Break and the Boy’s will have a fun Christmas Party. We have a shortage of Boys this year and we are actively looking for new members. So if anyone has a boy that may be interested please come on down we would love to have them. GIRLS BRIGADE The Girls’ Brigade is a great, safe place for girls to make friends while learning lifeskills and having fun. We are now open for another season are accepting new members. 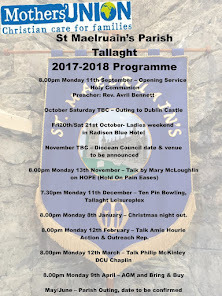 We meet every week from September to April in St Maelruain’s Parish hall where the girls learn dancing, singing, and arts & crafts. Our Explorer group (aged under 9 years old) meet every Saturday morning from 10.30am to 12.30pm. Our older girls (aged 9 years old and up) meet every Wednesday from 7pm to 8.30pm/9pm. If you are interesting in joining please contact Fiona Monahan (086-8519163) or go to www.girlsbrigadeirl.ie for more information. BOWLING CLUB We are looking forward to our Bowling Club Christmas Dinner which is being held in Lucan Golf Club on Friday 16th December. Our Captain Alan Stewart wishes all our members a very Happy Christmas . WHIST DRIVE The Christmas Whist ‘Turkey’ Drive is on Monday 19th at 8.00pm in the Main Hall. All Welcome! 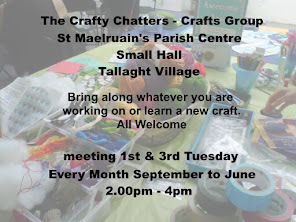 CRAFTY CHATTERS The Crafty Chatters will meet on Tuesdays 6th and 20th December, from 2 - 4pm in St. Maelruain's Parish Hall. If you are doing nothing please come and join the very friendly group and if you don’t want to do any crafts just come for the cuppa and have a chat!! 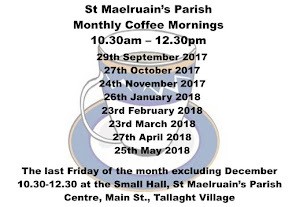 PARISH COFFEE Just to remind everyone that the Parish Coffee Morning will take a break in December but will be back on Friday 27th January 2017. We wish everyone a very Happy and Peaceful Christmas and New Year.